Posted October 8, 2015 by Emily Contador-Kelsall & filed under City News, Featured Inner West Independent, Inner West Independent. Marrickville Council wants you to grab those binoculars and get stickybeaking this weekend. Residents are being encouraged to participate in the upcoming Australian White Ibis Community Survey this Sunday, October 8. 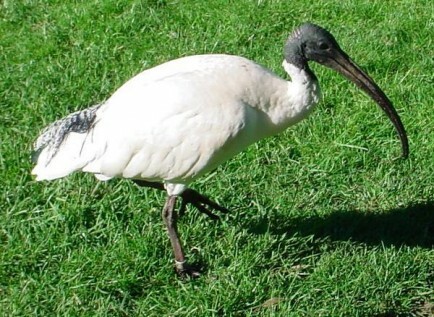 The Royal Botanic Gardens Wildlife Ecologist John Martin said the results would help them understand the White Ibis bird population, size and distribution. “At the moment, it’s smack bang in the middle of the breeding season and that’s why it’s a good time to do this survey,” he said. Mr Martin said that people often kill ibis birds to manage their numbers, which makes it important to understand if humans are having a negative impact on their population size. The Marrickville LGA is one of ten locations in Sydney supporting several breeding colonies. It was estimated that there were 100 ibises in Marrickville in 2014, down from 190 in 2007, according to a council media release. Mr Martin said it would be useful for Marrickville Council to understand the distribution of the birds in their area, because “they have done [of the birds] management in the past”. He said that a lower population is due to the council’s reduction of nesting habitats and not endangerment, adding that the ibis birds are a highly mobile species. “With the survey, we identify new areas where ibis are every year. They’re moving and they colonise new areas, probably because they get moved on,” Mr Martin said. Jacqueline Yetzotis from Marrickville community group Saving Our Trees said that trees suitable for ibis habitat had been lost or heavily pruned, and that food and water sources had been removed at Fraser Park, Tempe Reserve and the former Marrickville Hospital site. Mr Martin said a secondary aim of the survey was to raise awareness and knowledge that the Australian white ibis are native. “Because they’re abundant and in the urban environment, a lot of people assume that they’re an introduced species,” he said. This was also due to confusion between the similar-looking African sacred ibis, leading people to think they were introduced from Africa. Ms Yetzotis said that she thought the community would not want to see more ibis. “What is important is that ibis are allowed to have habitat because they are Australian native birds, a protected species and importantly, they are environmental refugees. We should support our wildlife,” Ms Yetzotis said. White ibis are drawn to the constant water and food supply available in urban environments, following drought and water supply changes inland. The survey has been conducted by the NSW National Parks and Wildlife Services every year since 2003. Mr Martin said that they have been marking birds with wingtags and encourages those taking part to record the tag number and colour. Counts made within a week of this Sunday October 11 and at any location are accepted. To take part: send tag number, tag colour, behaviour, location and time to ibis.sightings@gmail.com or fill out the survey found on the NSW Office of Environment & Heritage website.